Advanced technologies are driving innovation in the consumer’s purchase decision journey. Customer-centric companies are offering access to more convenient, immersive and personalized experiences for people to discover and buy their products. 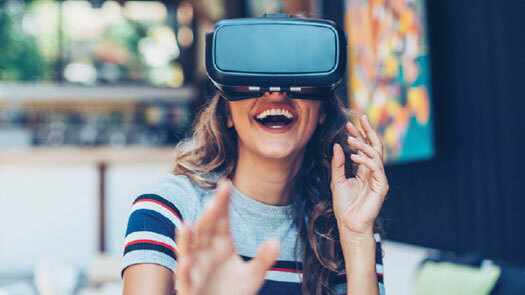 We look at how three trends—virtual reality, chatbots and data-driven personalization—are meeting the needs and lifestyles of today’s digital consumers. Chatbots and virtual agents will be the top consumer application of AI over the next five years, according to TechEmergence, an AI market research firm.5 Already this past summer, online ticketing sites Ticketmaster®, TickX and StubHub have launched chatbots on Facebook Messenger. Ticket sales from these platforms are proving to have a higher ticket value than other channels, says StubHub. Its chat services, which include iMessage, Skype and voice-assisted Alexa and Cortana, are useful for learning about customers’ habits and desires at the consumer’s pace, says Gary Kanazawa of StubHub Labs.6 Tapping into Facebook Messenger’s 1.2 billion monthly users, the new Ticketmaster Assistant chatbot helps fans easily learn about upcoming events, share links with friends, and click through to a seamless mobile purchase path. Travel industry leaders like Priceline and Kayak have already integrated chatbots into online trip planning via Facebook Messenger, Skype and Alexa. Now Allianz Partners, a world leader in travel and specialty insurance, is exploring these virtual assistants to enhance travel protection services. While customers can chat with a live assistant when comparing insurance plans and filing claims online, job seekers may interact with Allie, a chatbot that helps match talent to open positions on the company’s U.S. careers site. Allianz Partners is also developing automated SMS messages to notify customers of claim status updates via their mobile phones. The company envisions voice-based virtual assistants that enable travelers to purchase custom-tailored protection plans when booking their trips online. “Customers now expect companies to know who they are, what they like, how they shop, and where they are,” reports Clarabridge.com, an authority on customer experience.7 That requires a sophisticated use of customer data, analytics and automation. As consumers increasingly prefer authentic and conversational engagement with brands, a plethora of social media and mobile platforms are replacing easy-to-track traditional marketing CRMs. To customize travel, event and tuition protection products in real-time for its partners’ online customers, Allianz Partners utilizes a sophisticated quote engine and optimization platform. The company analyzes customer booking details, behavioral trends and other predictive data used to generate automated offers with best-matched insurance benefits in a fraction of a second. Leveraging a new machine learning-enabled quoting platform, Allianz Partners is further increasing its accuracy in predicting which consumers are more likely to buy which types of insurance benefits in the future.